This is a GREAT recipe, and it is guilt free! People that are looking to improve their health, and make better choices with their nutrition, we recommend that you prepare your food. This ranch dip is a great ‘go to’ that you can not over eat. You can have as much of it as you like with your cut up vegetables. In our weight loss group, we recommend that you get yourself some rubbermaid snack and dip sets. These are great! You can prepare them, and have them ready to go! If you open your refrigerator, and you just see a big bunch of carrots and a cucumber, it doesn’t look appetizing. And generally, by the time we go to the fridge and peek, we are already hungry and not wanting to prepare anything. But, if you see this in the fridge …… You think, “YUM”! Now, you can click on the image, and it will take you to the Amazon page to order the dip containers. Let’s get to how to fill them!! 4 Tablespoons Low Fat Sour Cream (Daisy Light has no chemicals in it). Mix all ingredients together very well. Chill and enjoy!! As you can see, the options would be endless! So, if you get sick of Ranch Dip, you can always change it up! Have fun, and don’t be afraid to experiment. Then, cut up your veggies, and you are on your way! 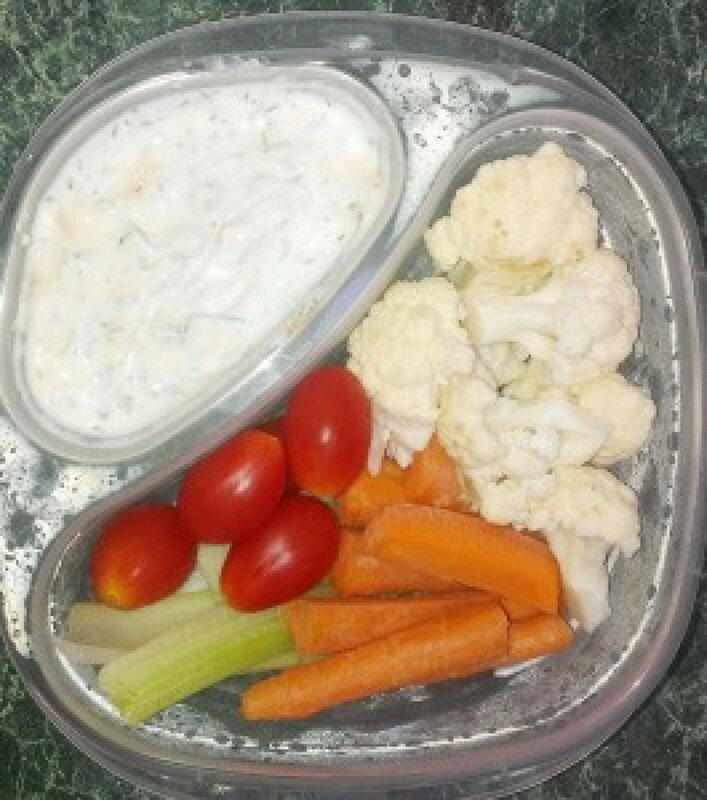 When you are wanting something salty and crunchy, grab for your veggies and dip instead of chips. You will be shocked at how satisfied you are! This dip is completely guilt free. There is very little fat in it! I would love to hear of any variations you try out! These are the dip containers that we love!